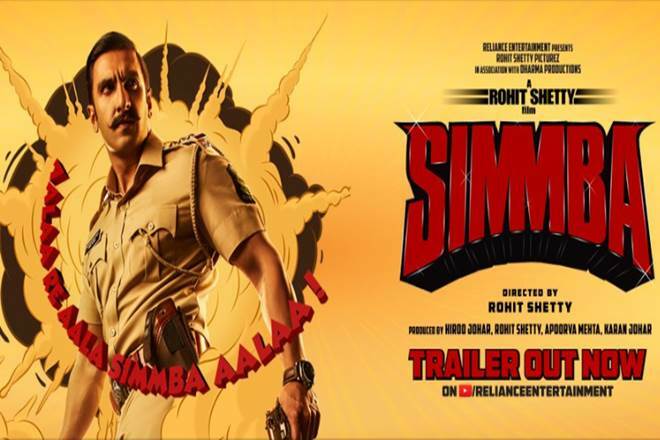 Your wait has finally come to an end as the makers have finally released the official trailer of the film Simba. The film has Ranveer Singh and Sara Ali Khan in the lead roles. The film is directed by Rohit Shetty, while it is produced by Karan Johar along with the Golmaal fame director. Interestingly, this is Sara Ali Khan’s (the daughter of Saif and Amira Singh) second film, which will be releasing after her debut movie Kedarnath opposite Sushant Singh Rajput. While for Ranveer Singh, it will be his first movie after getting hooked to Deepika Padukone last month in Italy. Ranveer is working for the first time with the action movie director Rohit Shetty and so with Sara Ali Khan as well. The film is produced under the banners – Dharma Productions and Rohit Shetty Picturez. As we know Shetty is known for his action films and thus Simba is certainly not an exception. The actor Ranveer Singh is playing the character of a police officer called ACP Sangram Bhalerao who is seen in fierce action. His life changes as he falls in love with the girl played by Sara Ali Khan. The film also has Ashutosh Rana and Sonu Sood who are playing key roles in the movie. Interestingly, the Golmaal boys too would be seen in this film in a cameo role which includes Arshad Warsi, Kunal Khemu, Tusshar Kapoor, and Shreyas Talpade.